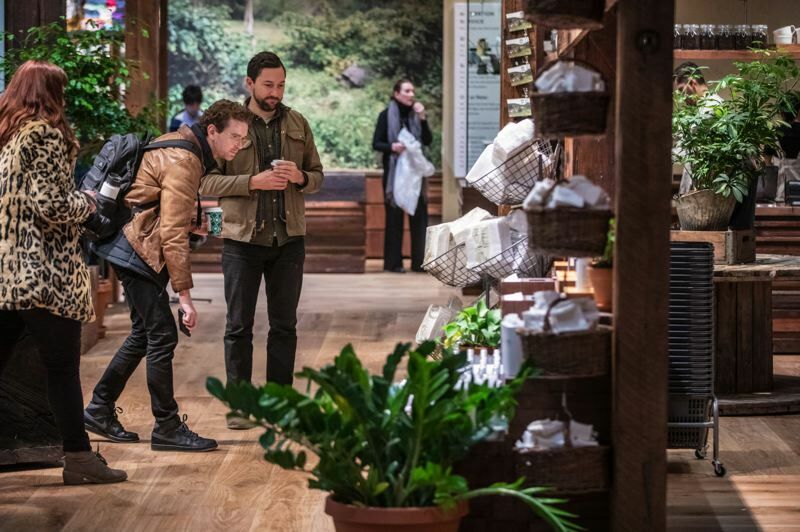 By moving into ground-floor space in the historic Meier & Frank Building, Japanese retailer Muji is adding a next chapter to the story of retail in Portland. Adam Rainey has been a fan of Muji since he first became aware of the Japanese retailer more than 20 years ago, when he was living in the New York City area, where the company has a widespread fan base. So, when Rainey learned Portland-based R&H Construction, where he now works as director of business development, was bidding to work on Muji's first store in the Pacific Northwest, he knew he wanted to be involved in the project. Since it was started in 1980 by a company called Seiyu Limited, Muji has built a reputation of providing quality products — from shirts and socks to innovative toothbrush holders and refillable soap containers — that are lacking in just one area. None of the items has a brand-name attached to it. In fact, the retailer says its full Japanese name, Mujirushi Ryohin, translates in English to "no brand, quality goods." The company also has unwavering commitments to recycling and avoiding waste. Old Muji clothing, for example, is dyed with indigo to become be a line of "new" products called ReMuji. Empty plastic bottles of various sizes and colors coupled with pouches of shampoo, conditioner and other products that can be used to refill the bottles are designed to help reduce the amount of plastic entering the waste stream. While Muji's line of approximately 4,000 products is consistent, the retailer's inventory is tailored to each store's location. The retailer also insists that each store reflect the flavor of where it's located. For the Portland store, the retail outlet's location in the historic Meier & Frank Building in downtown Portland meant the project would likely have a higher-than-average level of complexity. But that realization didn't dampen the enthusiasm of Rainey and the rest of the R&H crew for the project. "When you have client like this coming to Portland and you know you have the opportunity to work on a flagship store, you have that enthusiasm," Rainey said. "That enthusiasm is how you get these jobs." On a recent drizzly, gray November morning, as Muji staff prepared for the store's grand opening the next day, the lights and warm tones of the wood-heavy interior of the store caught the attention of more than a few passersby. 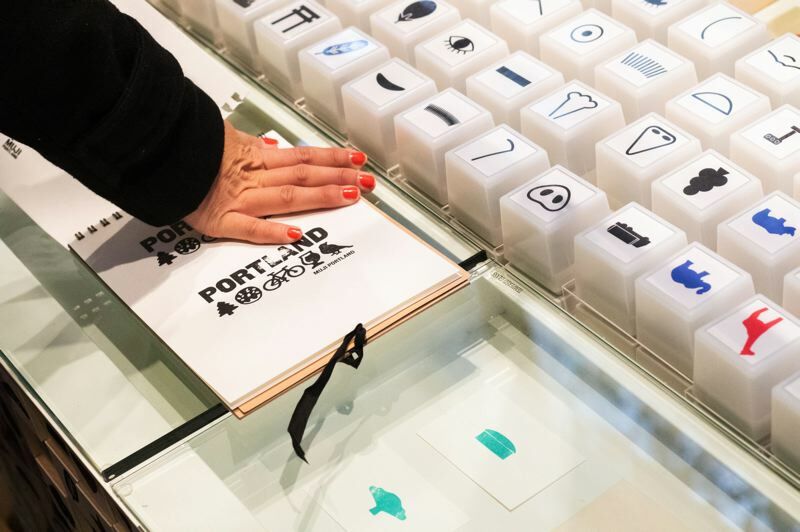 While the storefront location on Southwest Morrison and Southwest Fifth, across from the Nike store and Pioneer Place, offers great visibility, Muji's employees appreciate the location for another reason. They know they represent the next chapter in a building that has helped shape the history of retail in the city. In the early 1900s, the locally owned Meier & Frank department store decided to expand its existing building. Sigmund Frank and Portland architect A.E. Doyle took a trip to Chicago to look at how other department stores at the time looked. They were so inspired that they came back with a plan to build an entirely new structure on the block currently bordered by Southwest Fifth and Sixth avenues and Alder and Morrison streets. However, Frank's death in 1910 resulted in the building being built in stages, with major expansions taking place in 1915 and 1932. The structure was the first time Doyle used glazed terra cotta, though he would later tap the material as a common choice for the Portland buildings he would go on to design. The building held the distinction, until 1962, of being the second tallest building in Portland. It also boasted the first elevator ever installed in the city. In 2006, Macy's took over retail space in the building vacated when Meier & Frank closed. The Macy's space underwent an extensive renovation while the upper floors of the building were outfitted as the new home of luxury hotel The Nines. Macy's closed in April 2017. Now the building is finding new purpose. In September, Oregon State University began holding classes at its Portland Center on the second floor of the building. Other parts of the building are still empty, however, which ended up being a benefit once construction of the retail store began. The Muji store takes up just 15,000 square feet, so the team used unleased spaces nearby to lay down materials. Even so, with 60-plus workers toiling in the space at any given time, there wasn't an overabundance of elbow room. "It was a very tight space constantly," Rainey said. The fact that Muji's Portland location would be a flagship store was especially exciting for Rainey. 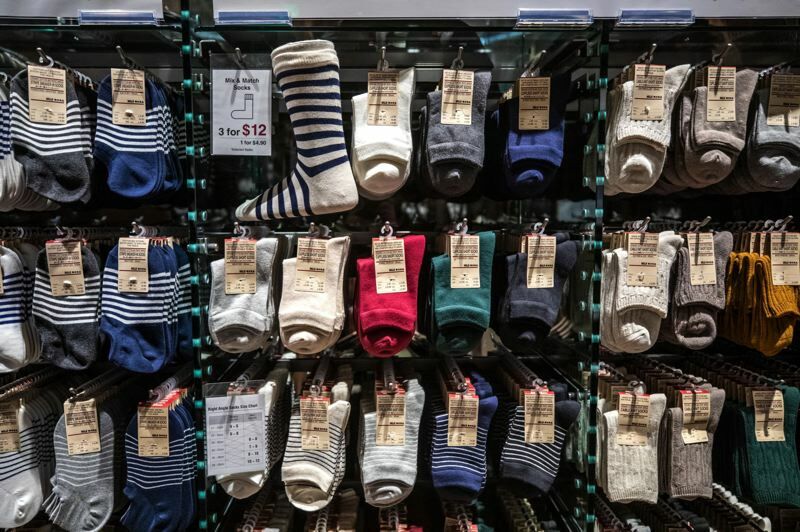 "[A Muji flagship store] usually highlights a lot more than just their product," he said. 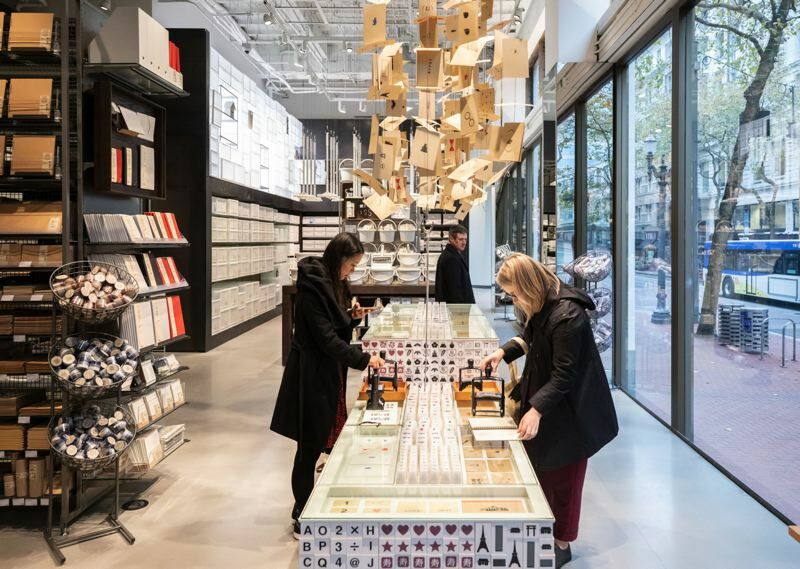 For Muji, the interior design and materials of the Portland store had to help explain — with texture and color and line, rather than words — the retailer's brand and mission. While Muji is as popular in Japan as Target is in the U.S. — though the Muji staff is quick to point out the shopping experiences are not the same — and has 900 stores around the world, the company currently only has 17 stores in the U.S. Five of those stores are in California, but only about 5 percent of people in that state are aware of Muji's products and mission, according to Eric Kobuchi, general manager of Muji's new business development department. In planning a move into the Pacific Northwest, the retailer considered opening a store in Seattle, Kobuchi said. 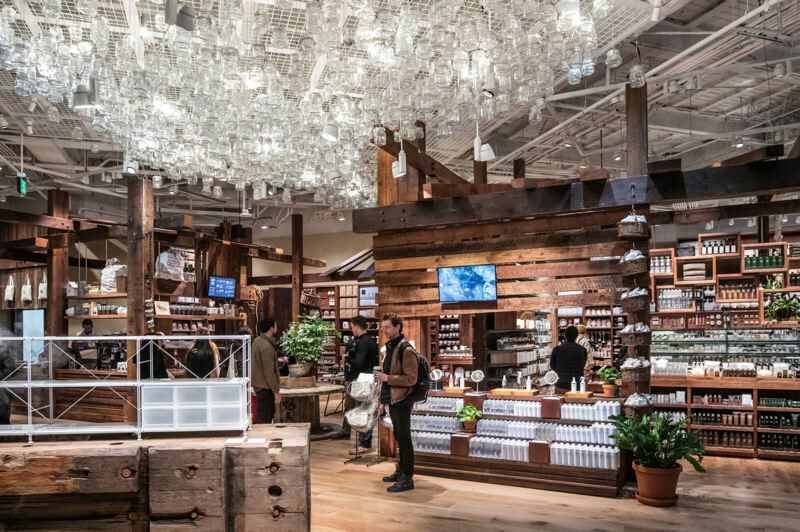 But it settled on Portland, in large part because Muji's leadership felt the Rose City's commitment to recycling and sustainability was more in tune with the retailer's way of doing business. When it came to interior design of its Portland location, the retailer and the project architect, a Japanese firm called Super Potato that Rainey says has worked on high-profile hotel lobbies and retail stores, continued to respect the local focus. The design team wanted to embrace Oregon and what the state represents, Rainey said, so more than 204 reclaimed old-growth timbers were used on the interior design. The timber, which was locally sourced, required some extra effort with regard to construction. Connecting the 12-by-12-inch beams and columns was like a puzzle, Rainey said. The team also had to bring in someone to grade each piece of timber to make sure that it was seismically sound enough to be used in a structural capacity. "We were delivered a concept package from [the architect] with general dimensions, but they wanted them to be organically raw; we also had the structural engineer's requirements (for structural soundness)," Rainey said. "That made it very complex, but it also made it very cool." Even the floor of the store received special attention to detail. While the floor boards are all riff-cut white oak, sections feature one of three stains: natural grain, dark stain or a white-wash stain. The three color concepts are used to separate different merchandise areas are in the store. 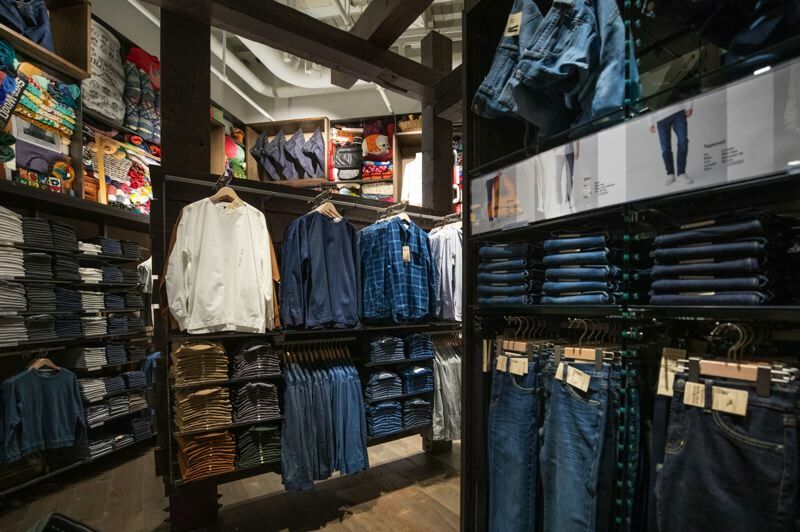 Sustainability isn't just limited to the interior design of the Portland store. The company has made environmental stewardship and supporting local farmers and other producers a regular part of how it does business, Kobuchi said. Clothing, bedding and bath towels for example, feature an organic cotton content of as much as 97 percent. The company's stores in Japan have restaurants included, which feature produce and fruit sourced from farms in the area. The company even finds a use for the crusts it cuts off sandwiches, a common practice in Japan, according to Kobuchi. Looking to put the crusts to good use, rather than simply tossing them in the trash, the company bakes them, adds seasoning and then packages the end result as a snack food that has become a favorite of shoppers. While the Portland location doesn't include a restaurant — though Kobuchi said that may change in the future — the store does contain a coffee bar featuring woodwork by Axiom Custom Products, a company in northeast Portland. In addition to coffee drinks and pastries at the coffee bar, shoppers will be able to buy bags of beans so they can enjoy brews from local companies at home. The first to be featured is Nossa Familia, a Portland-based roaster that specialized in sustainable specialty coffees. "We'll have new (roaster) every three or four months," Kobuchi said. "But they will always be local companies."